In September I was involved in the creation of a performance which was commissioned by Opera North, PRS and South Asian Arts UK to reflect on the 70th anniversary of the Partition of India. 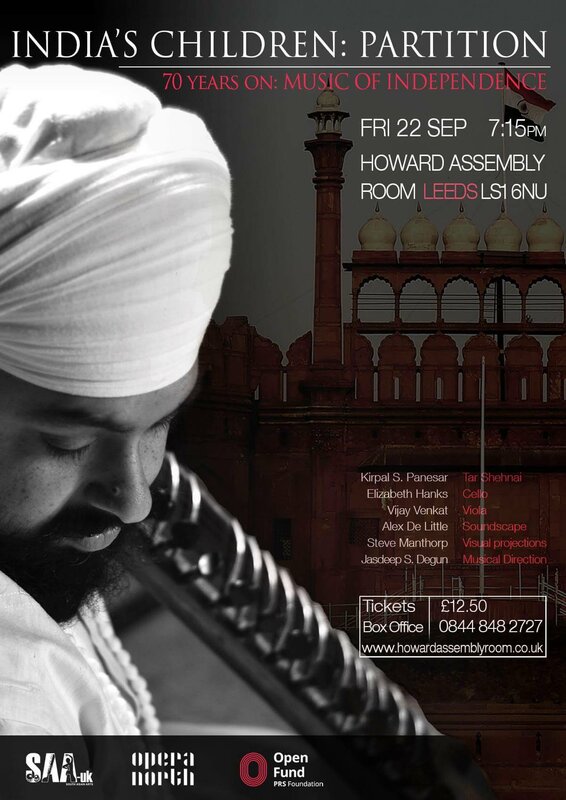 A week in residency with a group of three Indian and Western musicians culminated in a a performance at the Howard Assembly room on 22nd September. The group consisted of Cellist Liz Hanks, South Indian multi instrumentalist, Vijay Venkat, Visual Artist Steve Manthorp and Tar Shehnai player Kirpal Singh Panesar. Kirpal Singh brought a particularly poignant insight to the project as his late guru Ustad Bismillah Khan was the musician chosen by All India Radio to mark the moment of Partition as the clock struck midnight on 15 August1947. Each artist involved in the project brought their own perspective on and experience of Partition. From a personal perspective this commission was a learning process and I found myself struck by the gravity of this historical event and how its consequences still surround us in contemporary British society. On 15th August 1947 as the clock struck midnight, the legendary Shehnai player Ustad Bismillah Khan played the first notes of a hopeful and moving raag, as one country, at the stroke of a pen, became two. Inspired by that moment, this multimedia project and performance explores the Partition of India and its impact and legacy 70 years on: the joy of independence from British rule, the displacement of millions in the largest mass migration in human history and the sheer terror of sectarian violence in which as many as one million civilians died. Featuring the Tar Shehnai of Kirpal Singh Panesar with Vijay Venkat on Viola, Elizabeth Hanks on Cello, Sound Artist Alex De Little, and Visual Projections by Steve Manthorp. Musical direction by Jasdeep Singh Degun.